I’m back in town after being gone for almost a week, and finally getting to do a little work done on he airplane. 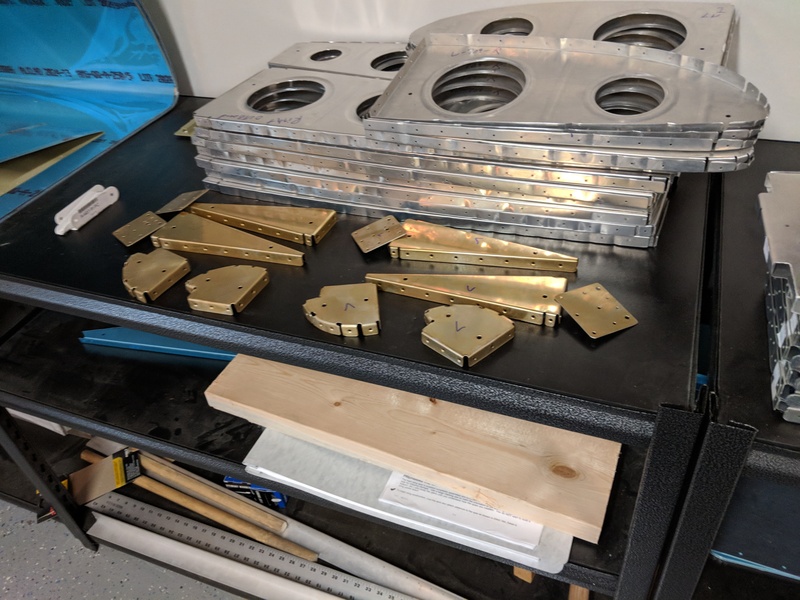 In the last session, I alodine’d some parts, so they’d be ready to prime when I got back. 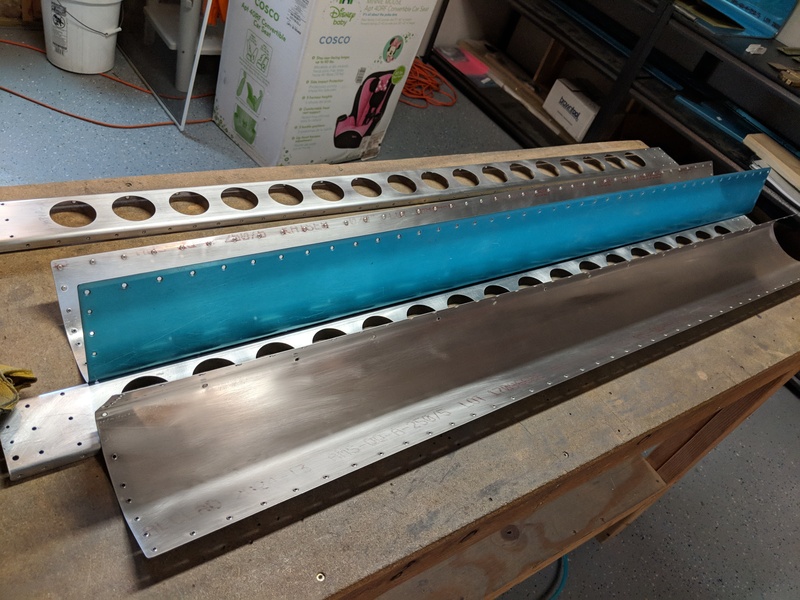 I am still using the old method of scuffing and cleaning on larger parts, since I don’t want to get really messy with alumaprep and alodine, so I started out by scuffing the leading edge skins and the aileron spars and then getting them nice and clean with acetone. Then I mixed up 4 ounces of AKZO, and let it sit for the 30 minutes while I got everything ready for painting. I moved all my parts into the booth, and then setup the ventilation system. Finally, it was time to shoot a little primer. 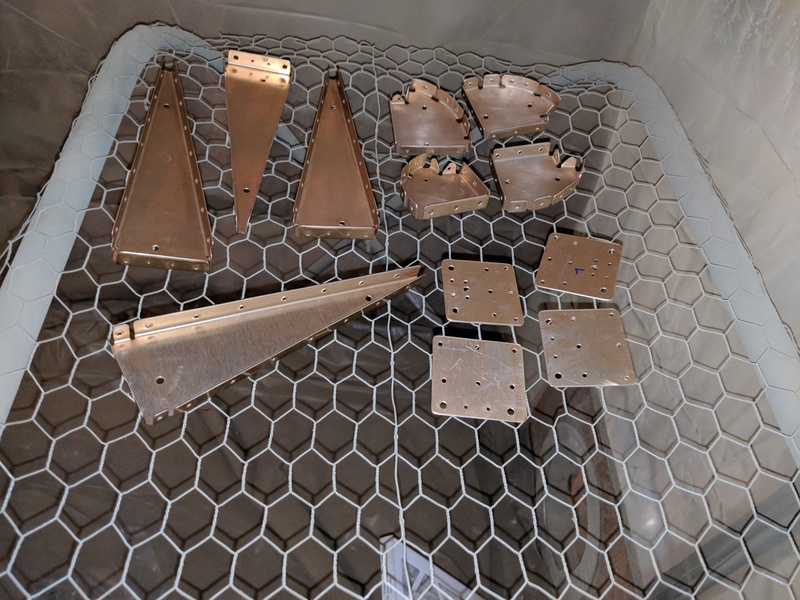 The 4 ounces was just enough to cover all these parts very nicely, and left me a little over to touch up any missed or thin spots I am really impressed with how well the Alodine parts absorb the primer, and how smooth of a finish it leaves. I can really see why professional sprayers use this stuff for their exterior parts. It makes a noobie like me come out with pretty decent primer jobs! 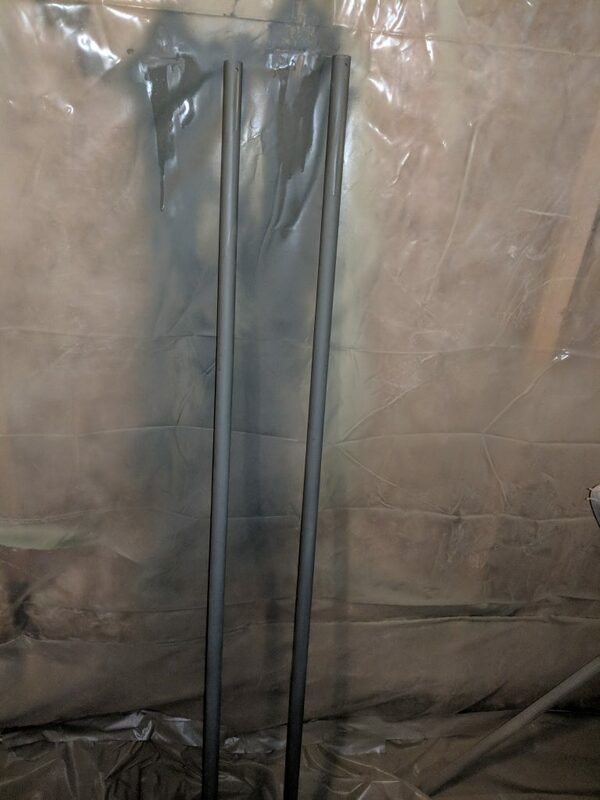 Since I had the ventilation setup, and everything ready for spraying, I decided to go ahead and get the galvanized pipe that’s used as the counterbalance primed as well. Initially I was just going to leave it galvanized, since the galvanization process leaves it pretty corrosion proof. BUT, I have been reading about corrosion between two different metals and decided to prime these as well. I scuffed them up with some scotchbrite to get a good surface bite for the primer, and then cleaned them with acetone. 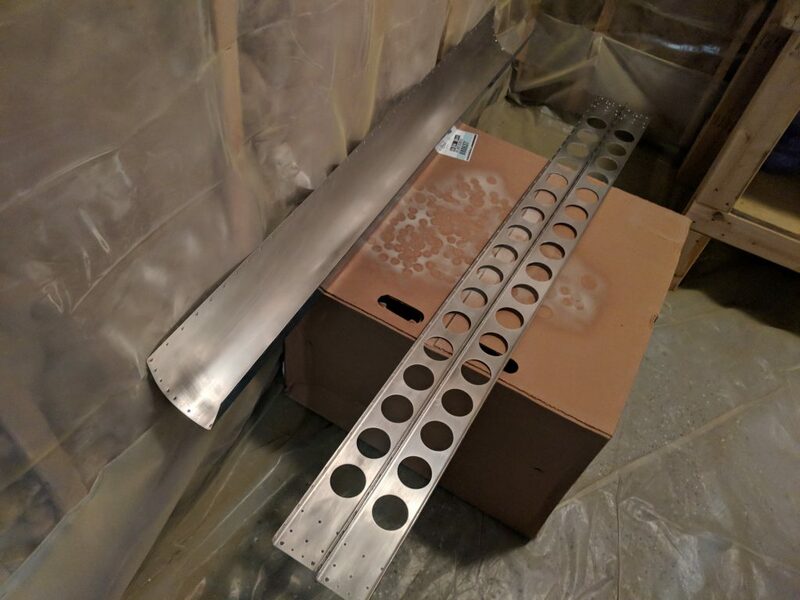 Instead of using AKZO, I decided to use some rattle can self-etching primer. 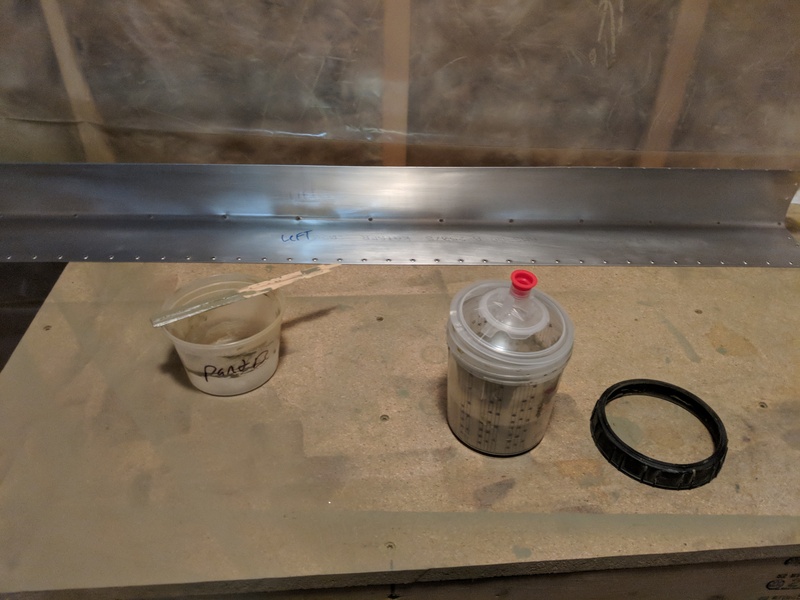 I am not sure how well a zinc-chromate epoxy primer would do on galvanized pipe, so I went with what I know works….plain old self-etching rattle can.